The stamp market is heating up in India, and as vast numbers of upwardly mobile Indian converts to the insidious cult of Philately enter the fold, their focus has been on topicals. 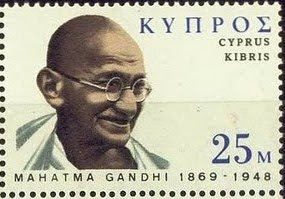 It should come as no surprise that among the most popular topicals in India are stamps featuring Gandhi. As all of the Gandhi stamps issued throughout the world are modern, the vast majority of them are still extremely inexpensive - two major exceptions to this being India's 1948 Mourning set (Scott #203-06) and the accompanying set of overprinted officials (Scott #O112A-12D) , both of which I tipped on September 16th of last year. However, Gandhi topicals have been so hyped recently that minor, unlisted errors (commonly known as "freaks"), which only a few years ago might have brought only slight premiums over the prices of the normal stamps, have sold for absurdly high prices. Normally, I'd consider such sensational "lemmings-to-the-sea" type of behavior to be a sign of a stamp market bubble for the issues affected, similar to the short-lived mania for Lady Diana issues following her tragic death. In my opinion, this situation is somewhat different, because the future of philately in India is very bright indeed, and because the topic is Gandhi, who many Indians view as being like Washington, Lincoln, Martin Luther King, Jr., and Jesus rolled into one. will survey the relevant issues in order to determine which seem the most undervalued. 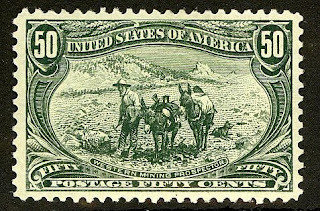 Such stamps will soar if the speculation pays off, and will hold up better than the frothier items if the bottom falls out of the market. As yet, I've found two issues that I particularly like. Both commemorate the Centenary of Gandhi's Birth. In 1969, Hungary issued a normal, perforated stamp picturing the Mahatma (Scott #2005 ; 582,000 issued; Scott '10 Cv= $ 1.25 for unused) which I am not recommending, along with an imperforate version of the same design (Scott #2005Note; 6,500 issued; $ 8.00 for unused or used), which I am. Hungary has issued relatively low quantities of imperforate versions of many of its stamps. As the imperforates were produced solely to generate foreign exchange by milking collectors, they were held in contempt until the fall of the Iron Curtain and the resurrection of capitalism in Hungary. 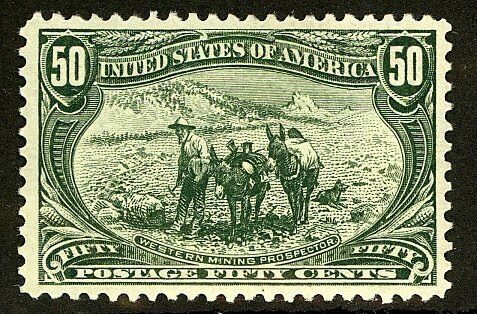 The normal, perforated stamp might do well, but the imperf represents a far better value. When purchasing the Gandhi imperf, the buyer should be somewhat careful, because since the common, perforated stamp has wide margins, its perfs could be trimmed off by an unscrupulous seller in order to make it appear imperforate. Probably the safest way to buy the imperf is to buy it in pairs or blocks, or tied to a First Day Cover. As many dealers are still unaware of the Gandhi craze, you may stumble upon such a cover in a dealer's dollar box. In 1970, Cyprus issued about 188,000 sets of two stamps (Scott #338-39) which Scott '10 values at $ 1.00 for unused. It's certainly inexpensive enough to accumulate in large quantities, and enough sets are available to make it susceptible to market manipulation. Attractively cacheted First Day Covers of Gandhi topicals are popular, so if you can locate FDCs for these issues at a slight premium, they're worth purchasing. Resist any temptation to pay astronomical prices for minor errors or "flyspeck" varieties. Addendum: Recently, StampSelector has recommended purchase of two additional Gandhi Issues- the Mauritius 1969 Gandhi set and souvenir sheet, and India's 2005 Salt March Souvenir Sheet.